Sheila C. Johnson has built an empire and living legacy that is more than worthy of the accolades and positive adjectives that are so often used in her presence. That legacy includes co-founding BET, running Salamander Hospitality’s bevy of hotels and resorts, producing prominent documentary and feature-length films (she’s currently an executive producer for Lee Daniel’s feature filmThe Butler), becoming America’s first African-American female billionaire, and becoming the first African-American woman to own a sports team (Washington’s Mystics, Wizards and Capitals). 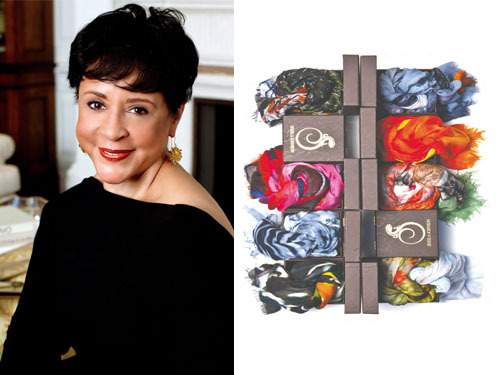 And now, this serial entrepreneur and philanthropist is getting into the fashion game with the Sheila Johnson Collection, a line of luxury scarves that feature one-of-a-kind photographs from her travels. I recently caught up with Mrs. Johnson to learn more about the Sheila Johnson Collection and its philanthropic mission, the story behind the recurring salamander theme in her businesses, and what her advice would be for young women who are interested in starting their own businesses. Hashtags + Stilettos (H+S): How would you describe the Sheila Johnson Collection to someone that was hearing/reading about it for the first time? Sheila Johnson (SJ): It reflects my passion for beauty, women’s empowerment, and artistic expression as captured through the lens of the camera. Everywhere I go, I take my camera. It forces me to slow down, and really look, and really see. And what I’ve seen is so inspiring, from the raw beauty of the natural landscape in my hometown of Middleburg, VA, to the courage of Haitian communities as they rebuild from disaster, to the resilience and strength of women in Africa. I’ve tried to capture those moments in time through my photography, and to share those stories with other women and men through wearable art. H+S: You’ve experienced considerable success with both BET and Salamander Hospitality. Why launch a new business at this stage in your life? SJ: I am a woman who does not like to sit still. When I see opportunities where I can continue to express myself and continue to challenge the boundaries of sharing my life with others — that’s what gets me out of bed every morning. H+S: In a recent interview you shared that photography has been one of your passions for a long time. What made you choose scarves as the medium for you to share your photos? 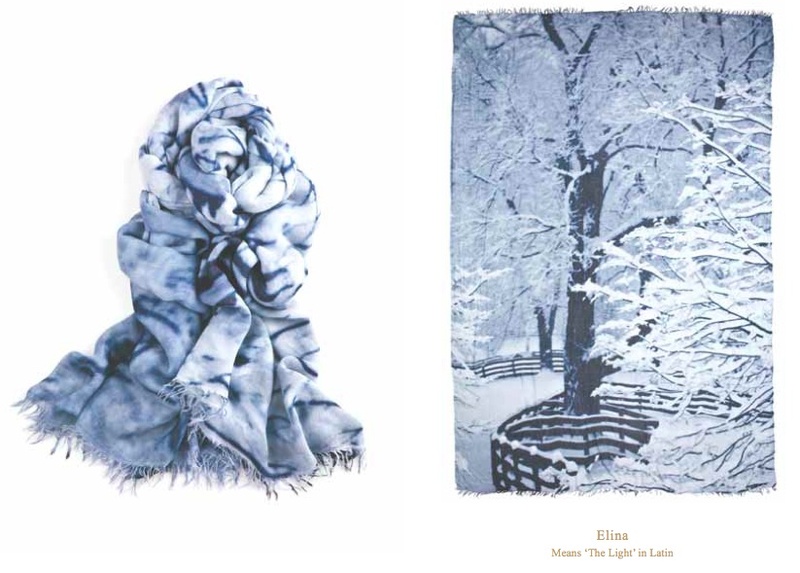 SJ: A scarf creates a lasting emotion of feeling nurtured and embraced. Scarves give warmth and tenderness, plus they are accessories that women can use anytime and anywhere. I wanted to draw on that feeling of closeness to give meaning to the stories represented in each scarf. H+S: You also revealed that you recently formed a street soccer team called the Lady Salamanders and that proceeds from the Sheila Johnson Collection will benefit the team. How did you get involved with the team and how have these women impacted your life? SJ: I first became aware of the street soccer movement when I served as executive producer of the documentary film Kicking It, which premiered at the 2008 Sundance Film Festival. I was inspired by the story of the players in that film, and realized there wasn’t the same focus on the women as on the men, even though they were struggling with the same problems of homelessness and addiction. Through the eyes of these women, you understand how vulnerable life is—and, also, how resilient the human spirit can be. I wanted to help support and empower them as they worked to overcome their challenges, find employment, and build stable, hopeful lives. So I sponsored and helped start the women’s national team, which is called the Lady Salamanders. I’m proud to say, they recently returned from Mexico City, where they competed in the Homeless World Cup! H+S: I noticed that you didn’t name it Sheila Johnson Scarves or any variation of that, do you plan on expanding beyond scarves and into other categories in the future? SJ: I already have. I have linens and ties that are available at Salamander Hotels & Resorts. I plan on continuing to expand. H+S: Salamanders are a recurring theme that show up in your business ventures. What is the significance of this animal for you? SJ: I bought my farm in Middleburg, VA, from a gentleman named Bruce Sundlun. He was a war hero and successful businessman who also served as Governor of Rhode Island. During World War II, he was on a bombing mission when his plane crashed over Nazi-occupied Belgium. For months, he managed to evade capture—and so he was given the code name “Salamander” after the amphibian that can mythically walk through fire. I was captivated by his story, and I also learned that for centuries the salamander has symbolized strength, courage, and fortitude. For example, if a salamander loses one of its limbs or its tail, it grows a new one. Resilience and perseverance are traits that really resonate with me, both professionally and personally. So with Bruce Sundlun’s permission, I continued the name, not only for my farm but for my brand. H+S: What is your life’s purpose? Have you discovered it yet? SJ: That’s a big question! Let me just say that my proudest accomplishment in life is my children. They are both amazing young people — one an athlete, one a designer — and they both work very hard and don’t take anything for granted. The job of a parent is the hardest and most rewarding job of all, and I would give up everything I’m doing just to keep my kids in my life. MN: What advice would you give a young woman who wants to start her own business? SJ: Surround yourself with people who share your vision and don’t have their own agenda. MN: What’s the best business advice you’ve ever received? SJ: Hire slowly… fire fast. H+S: Who and/or what inspires you? SJ: My family and my employees. H+S: You’ll forever be in the history books as being the co-founder of BET. But you still fly under the radar? Is that by design? SJ: I’m really focused on and excited by all the varied things I’m doing — in my work, in my philanthropy, and with my family and friends. I have an incredibly fulfilling life, and I feel grateful every day. Whether I’m “on the radar” or not is for others to decide; it isn’t how I think about my life. H+S: What are you most excited about for the future? SJ: I’m very excited about two big things on the horizon: first, the newest Salamander Resort & Spa in Middleburg, VA, which will be opening in August 2013; and second, the release of the feature film, The Butler, for which I am an executive producer. The Butler is based on the real-life story of Eugene Allen, an African American who served as White House butler over the course of three decades and eight presidents. It is directed by Lee Daniels and features an all-star cast including Forest Whitaker, Cuba Gooding, Jr., Lenny Kravitz, Oprah, Mariah Carey, John Cusack, Vanessa Redgrave, and Jane Fonda. I was present for much of the shooting in New Orleans, and I can tell you, it’s going to be great. *A version of this story appeared on MadameNoire.com.